Sarah gives State of State Address. Senate President Lyda Green is over her left shoulder. There's lots more on the site, starting at the beginning in 2006 when Sarah was still a gubernatorial candidate. The new ones have to do with Sarah calling the Bob and Mark Show. Uploaded by TECHNOLOGOS. - Family events, birthdays and parenting videos. I threw the audio onto this blog page (an old one) because the podcast gets changed every day on the website. It's from a show in Alaska (the DJ's a friend of Sarah Palin's) from Monday, October 5th, 2009. More awesome stuff with this guy and Sarah Palin here. She opens up with these guys more than anyone else because they're friends of hers. Nice little precursor to her book in this interview here. Listen to all three parts. It's an interview she gave to local Alaska talk show on 11-6-09 after getting back in Alaska having lost the election. MSLiberty: I used to be very interested in politics when I was younger, but I'd largely tuned out in recent years and wasn't at all interested in last year's election given how utterly obvious it was that the media was going to assure Obama's victory. Given that I was lukewarm toward McCain all along (toward all the primary candidates, actually, except for Huck whom I loathe), I had pretty much resigned myself to the idea that the country was doomed, that the days of a Reagan GOP were long behind us and never to return. And then, on August 29, my phone rang and my best friend -- a disenchanted PUMA and Hillary supporter -- excitedly announced, "McCain picked a woman for his running mate!" I asked who it was and she told me, "Her name is Sarah Palin. She is the governor of Alaska." Yogi41: The 28th and 29th of last year were very exciting. I remember being up all night, reading the posts at the PalinforVP, and getting thrilled when people there were tracking the plane route. Then, to wake up the next morning and have it all confirmed - simply amazing.Unfortunately, I had to attend a funeral that day for an acquaintance, but the sweet certainly outweighed the sadness. I remember one poster at that site phoned her house that evening, to see if she was home. Obviously, if she was home, there was no way she was the pick. I recall everyone getting excited when he got her answering machine, further fueling our hope that she was on the way to Ohio. It seemed wonderful to me, that here is a Governor with a listed phone number. I'm sure it's not listed anymore, but up to that day last year, anyone could call her up and talk to her. Too bad the hateful people had to ruin her accessibility to the people she governed, but what a rush to read that blog back then. frisky: I felt the same way about McCain not interested until Sarah Palin came along! I first heard of her from Dr. Laura's radio program. She was praising Sarah on not aborting her Down's Syndrome baby. When I heard it was a governor and she knew about the baby before it was born, I was shocked. Can any politician be that moral? Dr Laura said "Now there is a woman who has her priorities right"! 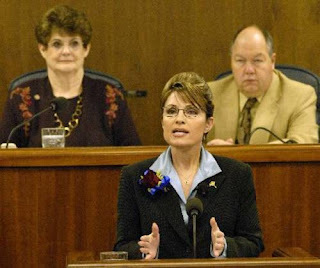 When McCain said Sarah Palin from Alaska my first thought was "Was this the same governor of Dr. Laura"? Yes it was! I heard her speech and was twice hooked! How this woman has been so mocked is beyond me! I too will celebrate Sarah Palin Day! piper4444205: My parents had to literally pay me to watch her convention speech because I hated politics until I heard her speech. I was completly glued, she had me on the very first sentence. Now I can't get enough of politics. After the convention speech I gave back the money my parents payed me. I even changed my major from English to History, and now I'm minoring in political science, and once i'm ready i'm going to run for Mayor. gardunne63: I first became aware of Sarah in Feb '2008 when "Vogue" featured her in that issue. Despite being a rather lefty woman's publication (what isn't?) , the article was very fair and it was clear the writer knew Sarah was destined for greater things than living in Juneau. I usually throw away my Vogue issues a month or two after receiving them, but I knew then this was one issue to hold on to. billinbaltimore: I am not kidding you: My wife fell on the floor in our hotel room when we listened to her tell us about herself and her family. Well, to be perfectly clear, she threw herself towards / on the bed, landing on her knees. But how appropriate.I too was politically born on that day and have not wavered since. And to think in the :20 minute speech, I knew EXACTLY what Sarah Palin stood for, and she has lived up to every aspect of her introduction. Yet after seven weeks, Peggy Noonan proclaimed, "I have no idea what she stands for" ... sheesh. As you study her more and more, you realize, she is fundamentally the same as she was from the time of elementary school. That is very exciting and encouraging. I am also not kidding you: my life has been changed forever by her, regardless of what she does in the next three years and beyond.I am writing my testimony to the "effect of Sarah Palin", but in a nutshell, I took on a new direction in my career, one that has opened up amazing opportunities, and it was inspired by her standing up to the fat cats in Alaska. Sarah metaphorically says "I see things differently", and those were my exact words to MY fat cat colleague last fall, and he is no longer with our organization, and my work has completely obliterated his feeble attempt at controlling the "little people". (btw, my new career direction is web site development. and you will see more on this later. I was going to hit the streets on Aug 29 but I will just celebrate quietly and thankfully like the rest of you, but it will be Kahlua and cream, I can't stand wine ...) (I'll be doing something big, in my pathetic way, o/a Sept 13, to keep the momentum going after the Tea Party. )Lastly, I have raised two "Sarah Palins", one in gov't in DC and one at Grove City College. It's better than anything any of us could have ever imagined, no ?Thank you John McCain and Fred Barnes !and Thank you Chuck and Sally Heath ! Izzy: Sarah is good 'ground' to sow into. Definitely I am in.I remember I so nervous about the other choices V.P. When Sarah Palin was confirmed as the choice I had a PEACE even though I had never heard or seen her before...I told my wife "that's it".My conscious was right. My family and I love Sarah and her family.Not to brag but Sarah and I, we both have the same birthday (Feb.11). What an honor! Yogi41: Let's see if I can make this short. :)I've mentioned a few times that I followed the Democrats primary much more so than I did our own. I thought our guys were very boring and not one of them interested me. I still watched the debates, but I couldn't get excited about it. The Dems primary was a different story. I'm very conservative, but I also really, really want a female for President. So, I did root hard and heavy for Hillary and followed every single detail about that primary since 2007. I shared the lies, the smears, the cheating and the ruthlessness that every Hillary supporter endured during that time. I was a regular on many liberal blogs; not because I shared their political point of view, but because I wanted to see a woman prevail, and to my mind, if it had to be Hillary, then so be it. When it was becoming clear to me that Hillary was not going to get the nomination, around April or so, I started getting interested in McCain's choices for V.P. I was really hoping for a woman, and I started to research the prospects. That's how I came across Sarah Palin. It was the energy issue that grabbed me, but it was also her entire conservative way of life and governance. I couldn't believe it. How lucky to finally find a candidate who embodies everything I want in a President. I didn't have to settle for any woman; here was THE woman that fit the bill. So, I wrote McCain weekly, asking him to choose her. I stumbled across Adam's blog and although I never posted, I read other people's opinion and knew I found like-minded people.The rest, I already said. That night prior to her announcement was amazing and I'll never forget how excited everyone was, knowing she was the pick, even though the media kept denying it. So much for keeping it short. chicago's conservative: August 29th is actually my birthday lol. But just about a year ago on the night before, I was thinking to myself "Man, he (McCain) has to pick someone out of the box." I knew who Sarah was and had watched some of her appearances on Glenn Beck's show and on CNBC with Kudlow. I thought she would have been the best pick, but I did not think McCain would actually do it. I just did not see it happening with someone like Romney or Pawlenty. When I discovered it was in fact Sarah, I was shocked, but definitely happy. Only then was I to discover just how vicious her threatened opponents were going to be. I knew she was going to be treated unfairly, but certainly not with the vitriol that soon followed. I look back on this somewhat disappointed, then I remind myself that better things are to come for her. It was merely a step on to something much bigger. terri: I didn't know anything about Sarah Palin. Absolutely never even heard of her before. I was soo distraught that Mcain got the nomination and at the rupublican party that I just didn't give a s***. But then when I heard that he had nominated a female for his running mate...my ears perked up big time. I made a point to watch her convention speech and I was hooked. Shyann, I too started to cry. I thought right then, "she is me"and I couldn't believe it. I have watched that speech several times since and each time I get goosebumps. Needless to say when I voted, it was not for Mcain but for Sarah. There is not a day that goes by that I don't think of her. BettyJoBialowski: I am one of those people who knew Sarah was chosen by early morning on August 29th. But my Sarah story is what happened on April 22, 2008. I'll never forget standing in my living room when I heard the TV news reporter say that Trig had Down Syndrome. Just like that a shiver traveled at lightening speed down the entire length of my spine. I remember saying to myself, "The vice presidency may not be in store for Sarah, but God has big plans for this woman." And I was right! manajordan: I can hardly believe it's almost been a year. Last year at this time I was going on and on about Sarah Palin to my co-workers. The day she was announced I got a big ol high five from my boss. I think one of my first thoughts when I realized that she was the pick is how my future daughters would have a woman of my political ideals to look up to. What a great day that was. PEC: I remember that night. I remember some people were wanting to call the Palin's house to see if they were home. Supposedly Sarah had a listed # and one of the bloggers was wanting to build up the courage to call. I think I went on about 2 hours sleep that night. BILL IN baltimore: When Sarah gave her convention speech, I was going nuts. My son was in the room, and he must of thought I was raving mad.The lipstick joke is beyond classic, it's prophetic.But I proclaimed then, "You are looking at the first female POTUS".And I am still saying that. William Henley: Me, I am just a drunk who loves his rot-gut whiskey. I have followed Sarah since she was a mayor in the itty-bitty city of Wasilla. I got mad at her for starting a 2% sales tax in the town that I must shop in (got over that as I saw the good it did). I was overly proud of her for quitting her job in the oil ministry because of "good ole boy" policies and corruption. I fought for her unfailingly when she ran for Govenor and on the morning she was picked for VP I had just woke up with a terrible hangover. The phone was ringing off of its hook. I answered and the voice shouted: "Sarah is running for VP with McCain." The voice was my better half calling from Colorado where she was visiting her sister. I turned on the TV and nearly forgot to make coffee. The rest is history and shall continue to make history.In my 55 years, I have never given a penny to any "lying" candidate and never in my life did I think that I would. After donating so much time to Sarah all I can say is: "Sarah Palin Day, hip hip hooray" I will donate my $29 dollars to the cause. Yogi41: You and Camille Paglia. I remember her article in Salon, where she wrote of Sarah Palin's national debut in Ohio:“We may be seeing the first woman president. As a Democrat, I am reeling." Shyann Canon: Gosh, so many stories with so many similarities and yet coming from so many different places. I, too, made my then 11 year old son watch her convention speech and I was just so proud of her and I turned to my son and said....you just heard the future POTUS....I don't know when that will be son, but it will be in both our lifetimes. He just rolled his eyes at me, but I could tell he was impressed. I am still working on my somewhat disillusioned and completely in denial husband, who thinks I am nutso, but he will come around. I'll make him! Ha!God bless all of you, this site lifts my spirits and gives me hope. Jane Austen: I too have been inspired by Sarah. I'm planning to go to college and major in political science. I did visit DC a couple of months ago and I even though I fell in love with it, it definitely needs help. I'm not sure how I'm going to make it, but I'm going to hopefully clean up the place- just like Sarah! It would be awesome if I could get a job there while (if) she is madame president. Dr. Vicki: Like Yogi, I too was hanging out on Adam's blog that night hoping and praying Sarah would be the pick. It was really very exciting when the info about tracking the planes starting coming in on the blog. I think I stayed up until about 2 in the morning then got right back up. It was pretty cool that we knew before even FOX and the other cables knew. Lipstick: I was not following the election at all. I disliked Obama and McCain. I was in Richmond Virginia for a NASCAR race that weekend.I saw it on TV and thought...Who? Then I moved on. The race was awesome. I flew home, where Ike was making a beeline for my home. Then Ike hit and I was without lights for many days, school was closed for two weeks and I had roof problems and water in part of my home. Needless to say I was not following Palin. Then, with my electricity restored, I settled in to watch the RNC speech because, well, it was a woman and I wanted to see it.I was floored. I thought "Good grief, this woman kicks tail, this woman is not afraid, this woman is a true conservative, this woman should be at the top of the ticket. "I have been a rabid Palin supporter from that moment on. $29 to SarahPac on August 29th. blestmom - (RANDOM, NOT A STORY) JaneAusten-Yes, they really do call them "The Sarah." Funny story...when she came home to Wasilla to cast her vote on election day, lots of us supporters were lining the street on the way to the polling place. It was pitch black outside (remember this is Alaska and it's dark at 6:00 a.m. in the winter here). We saw the flashing red lights of her motorcade...coming closer and closer...and then, the motorcade turned off early. We were all bummed thinking we weren't going to see her, and she had changed her route.Turns out she was just grabbing a mocha on the way...and about 5 minutes later, here she comes! LOLBy the way, after she voted, she came over and talked with several of us. She was very gracious. LGS: August 29, 2008 was an exciting day for me too. I had just barely heard of Sarah Palin over at Freerepublic. I was pretty disheartened by the boring Republican choices and I wasn't really paying attention, so I hadn't even bothered to read the Sarah postings carefully.I just knew that some people were advocating for her selection with passion. As McCain's VP announcement drew closer and closer, I found myself hoping that he would go with this long shot. A women would be interesting! And I was starting to get the idea that there might be something special about her too. Why else were some faithful fans promoting her with so much fervor?I was on the cable networks all morning on the 29th and I was getting more and more excited as it became clear that Sarah Palin would be the surprise pick. YES!! Suddenly I cared about the election! Then she spoke in Ohio and I found that I too was passionate about her! She had me at her first speech. My brother, a strong conservative, was also excited. I'm sure he will join me on Saturday with a donation of $29 and some wine in honor of the best politician in America today. God Bless Sarah Palin and her family! I can't wait to hear her speak again! Hopefully it won't be a long wait. Sarah, we want you to keep speaking on our behaf. We trust you and your good governing principles and skills! We need your help to get out of our frightful national mess.Sarah, visit your Facebook on the 29th. We'll be there supporting you and drowning out any foolish trolls that are caught up in the Democrats "Facebook lies" lie. Thankfully, the opposition's one year attack on you and your family has made you virtually indestructible. More and more people's eyes are being opened and are seeing the real you; more and more people know who the real liars are on the national stage. Thanks to you, I think we have a chance to turn things around in this country. Carrie: Unlike many C4P followers I didn't catch the Sarah-bug until early September. In August my family and I sat glued to the Olympics. Cheering, crying, learning as normal people achieved greatness through extensive effort. Knowing how ugly the upcoming conventions were going to be I too avoided them at all costs. On Aug. 29th I was 600 miles away from home, helping my first child get settled at college. My husband was sitting bedside with his dying father. And eventually I was driving my other 2 kids and I back home to start their school year. My husband had mentioned McCain chose a woman from Alaska, but neither of us got enthused. However, when I returned home I was shocked by this beautiful face that covered the magazines where Obama's face had been for months. I rewound politics fast. I am a Reagan American if there ever was one. (Those updates take a while)I sat up late and listened to her first official addresses. I bought all the magazines and I soared. Just like the Olympics earlier in August I sat glued to TV coverage, good and bad, I screamed, I cried, I cheered. I dragged my two kids to the TV and again told them the stories of personal perserverance that I'd applied to athletes they loved. Now today when I sit down to the computer everyone says, "Oh mom's Sarahizing". The've grown to love the Palin family as people, not just politics. We've run our own race a bit stronger because of their effort. So yes count us in $29 - twice. Once for me once for the my kids. RINO-hunter: Although I'd never been to Brickley's site until recently, I'd been pushing her name on FR and elsewhere for VP since late last spring/ early last summer, but I never thought it would actually happen. I got in the car on that Friday morning and my jaw dropped when I heard Sarah giving her first speech as VP candidate. I was so pumped I could barely drive. I'd been bummed because I was a Fred supporter and donor and McCain was absolutely my least favorite candidate (with the possible exception of Huckabee). So after being horribly disappointed in the primary, something finally went wonderfully right. I knew he couldn't pick Fred because another old white guy on the ticket just wouldn't work, and nobody else could have brought the energy to the campaign that Sarah did. ellen: I am in the same boat. I didn't care about politics at all until I heard her announcement. It made me look into talk radio and things like that. I didn't change my major tho! Good luck to you.I'm guessing there are a lot more young/ college age kids out there who voted for Palin their first time voting, and would love the chance to vote for her again. I know I would. M. Minnesota: I first heard about Gov. Palin around March 2008. Started reading about her. Politically, she had me at Hello. :-) Anyway I thought that there was no way Mccain would pick her,because of the dust-up Mccain had with evangelicals in 2000.Then in April, I discovered Adam's Blog. We should have a day honoring the first day his sarahpalinforvp.blogspot went live. January 2008? December 2007? Followed the blog everyday since then. It's great to see some of the "old timers still around, Gelston, Dr. Vicki, BettyJO, and many others! !I would strongly encourage anyone to read the blog entries from August 28th-29 on sarahpalinforvp.blogspot.com It reads like a political thriller!!! johnfromcanada: I vividly rememeber sitting at my desk on the morning of Aug 29, 2008and watching my computer screen with the MSNBC live feed of her introduction speech. I was mesmerized by it at the time and still feel the that way as I watch it again tonight. What a speech! Electrifying, really. It was clear that she was someone really different and really special. No wonder the Obama campaign went into attack mode immediately (as you can hear at the end of that CBS clip - they recognized very quickly that she spelled big trouble). I spent several hours that weekend surfing the 'net trying to find out all I could about Sarah Palin. And what I found and what I heard I liked. A lot. I could just see her not only as VP but as POTUS. I could hardly wait for her acceptaince speech. Well, it's been quite a year with lots of ups and downs. But I still believe that she is the next POTUS, whether in '12 or '16, (hopefully '12) I'm not sure, but this woman is a born leader. We all need her. Happy August 29, 2009 everyone - Sarah Day! What God has revealed to me in these last few days is what a moment this is. It's like a moment I was born for. I was born for all of it right down to her "Piper pray with me", to her burnette bangs. Like a dream I've been strangly having all of my life yet it was not clear.Over the last year it has been coming clearer. We have ALL been brought to the Kingdom for such a time as this. Obama and his "csars" take control over major parts of the nations economy! It's a scene right out of Atlas Srugged! It all seems dark and hopeless. But God is working!Glenn Beck is giving us the real bad numbers. The Tea Parties are the people gathering. Rush Limbaugh, Levin, Hannity and Beck are all John Galt ranting on the radio at the end of book. Sarah is the evidence that God is in it! Trig is evidence that God is in it! He has not forsaken us!There is no doubt!Lincon said "you can't fool all the people all of the time". That's not just a quip... that's prophetic! People are opening their eyes and seeing. Sarah is seeing. Keep praying... God is moving! M. Lopez: I was watching it live (on Fox News of course) and upon seeing that McCain had picked a woman I jumped out of my easy chair excited and stood two feet from the television screen. I listened carefully to her acceptance speech and when she was done I jumped around my living room like a school-girl for who knows how long, completely ecstatic and rejuvenated about McCain's candidacy and the awesome new ticket! Devin: The night before the announcement I was looking up the posible candidates that everyone had narrowed down. Sarah was the last one I looked at and when I did an image search of her on Yahoo there were literally only like 15 results (now there's a few thousand). Anyways, at the time I was 14 so I was going to bed early and getting up very late since it was summer. When I woke up that afternoon I jumped on the computer and there is was- HE PICKED THE WOMAN! At that time I was a Democrat, but her convention speeched turned me into a Republican so on September 3rd I will be celebrating ONE YEAR SINCE I BECAME A REPUBLICAN!!! I LOVE SARAH!!! MMCL: I had hoped McCain would take a risk with his VP pick. Something needed to happen or he was going to lose. I heard about Palin and I thought: he did it. I remember feeling nervous as well as excited. I was too nervous to watch her RNC speech; I prayed the whole time she was giving it, then watched the video.I had never heard of Sarah Palin before. But she has defined this entire year for me. She was the reason for my political awakening. SarahFan: OK, here's my story on Sarah. I didn't know who she was when she was introduced. I was listening on the radio and got the lowdown on her politics and it got my attention. I first saw her face on t.v. when drilling in AK was a topic on the news. I liked what I saw. This was before she was picked as VP. The more I learned about her the more I knew she was "it". With overwhelming anticipation I watched her RNC speech and knew a star was born. She hit it out of the ballpark that night. She is God's gift to America. I have hated politics and didn't pay that much attention until this last election. I have since turned into an active supporter and will do everything in my power to get her into the white house, should she choose to run. The media spin on her opened my eyes to their bias and I am absolutely disgusted with them and have since only watched Fox and listened to talk radio. Sarah is EXACTLY what we need in this country to get us back on track to the Godly nation we are endowed with by God's grace. AMEN! T. Yaun: I was cleaning house when I heard Sarah Palin was chosen. My mother and I were ecstatic. After hearing her speak at the convention I started to believe in truth in politics again. Sarah's the real deal. And I have been so angry at the way she and her lovely family have been treated. Fox News seems to be the only news media that has treated her fairly, so I only watch Fox. I no longer have any use for Katie Couric, David Letterman Campbell Brown and many more. NBC,ABC,CNN,MSNBC are not allowed to be on my television. I pray for Sarah and her family everyday, and I am a PROUD supporter of Sarah Palin, and we are going to get her in the White House! Theresa: I always take this week off for vacation every year. I was waiting patiently for Senator McCain to announce his Vice President. I knew that it needed to be someone who had to lift McCain out of the shadow of Obama. By the time Sarah Palin was done talking, tears were running down both sides of my cheek. I've never lost that feeling from the day she first spoke and the convention. That very day was also the last time I ever watched CNN. When I heard the most disgusting things come from Campbell Brown. It was also the first time I wrote an email to someone in the media. I told Campbell that Sarah Palin has just woke up all the sleeping women who thought they were pro women rights but found out people like here think more than one child makes you trash. I told her there were two types of women in this world and Sarah Palin was on the side that has a career, have a family, enjoys life, and fights for women rights. (Supermom) not just some twit who puts career first and believes children hold women back.I will never go back to taking a second seat behind women like Campbell Brown. Thanks Sarah! bpearls: I had never heard of Sarah! I was a loyal HUCK FAN....and when McCain won...I was so very mad at him! I couldn't care a rip about his VP choice..I wasn't even going to vote this time! I was working at home and watching TV on the run....and then when she reached the platform and began to speak..I just cried.....I knew she was the Real deal! I love Sarah Palin.....she is Leader and a friend! [I lost the names of the people on these next two stories. Sorry] - I was working the day Sarah was introduced as McCain's runningmate, so unfortunately I missed seeing her speech. However, a few months prior I had heard that she was one of four people being considered. They said she was pro-life and a lifetime member of the NRA. I immediately thought "That's my kind of person - he will never choose her." But he did!!!! The more I learned about her, the more I was impressed. She was a real person - not just a politician. She loved her country and the military. She had integrity and would stand up to anyone including her own party. Her speech at the convention was amazing!! Now I was so excited about the election. Finally, there was a person (a woman) who represented me. As time has gone on, I have continued to pay close attention to the words and actions of Sarah Palin. I'm more impressed. Nameless story two: I was in our whelping room tending our 4 litters of Cavalier King Charles Spaniel puppies with one of our adult daughters when the announcement was made and daughter Kathy and I cheered as she gave her speech in Dayton. I am still in aw of this woman's ability to grab an audience with her words and sincerity. Nikki T: I watch MSNBC in the morning because I like Joe...sorry...but I like him. H ticks me off sometimes, but the debate in the morning on there is insightful and I like to hear what our opponents are thinking. He said he had inside info it was Romney. Romney and Palin were my choices. They then had false confirmation of Romney being in Ohio. Then they had confirmation that he was in Cali, so I knew it wasn't him. Pawlenty was out, Romney was out....could it be PALIN? Nah...I thought. Then I started to flip around and heard Fox mention they had confirmation of two planes with Alaskan manifests that flew to outside Dayton. I began to jump up and down, pump my fists and cry. I am crying now just thinking of it. P.S. Adams: I was at work and I saw it on FoxNews.com. I started Googling her and researching her. I play this little game with myself called "draw an opinion first" and see what Rush says on his radio show (Rush usually agrees with me 99.6% of the time). So this day, I was googling and the more I read about her, the more I was amazed.I remember thinking to myself, "nah, this is is too good to be true." Then I pulled all my info together, went on break and thought about it. I was excited. I was like, wow, she has views very similar to mine. I remember thinking, "I can be represented on this ticket now. "So I made the call that I was going to be enthusiastic and positive about this selection. When I went to lunch, I put Rush on and boy did he ever confirm what I was thinking. I remember him being ecstatic about the choice.I told my friends, I can't believe what a great pick it was.Then I watched the convention speech the following week. The day after the speech, I sent an email out to all my friends declaring her the next Ronald Reagan. After hitting the send button, I said to myself "what have you just done? That's Ronald Reagan you're talking about. He's a god, man! Noone can measure up to him." So I thought about it another minute and I asked myself: what's been missing here? We haven't had a Ronald Reagan since, Ronald Reagan. And I thought and I said, you know what, I'm going with my gut here. I stand by it. She's the best thing we've ever had since Reagan.Then I read Michael Reagan's column and was blown away. He wrote Welcome Back, Dad. I feared for a minute that I might have committed "political blasphemy." But if it was good enough for Ronald Reagan's son, it was good enough for me. I can't tell you how emotional I felt reading that article.I drove my friends nuts after that with emails. Then I decided to start blogging around the end of the campaign and now I'm here in the Palin army.The shining city on a hill awaits. It will be a long drawn out battle. But we will win. Sarah Palin, you and the American people have a rendezvous with destiny. H. Roth: I was driving around listening to Rush play her speech on August 29th. I was SO PUMPED when I heard a woman's voice because I hoped McCain would pick a woman. As I learned more about Sarah, I got more excited.It was an awesome day. Barbara: I had heard Sarah speak on a radio news show approximately 3 months before and I said, Wow how come she isn't up there running? Then when the RNC had the convention and Mccain announced her, I was excited! Her speech there blew me away. THEN my Mother called me (one of the most non political people I knew at that time) and was totally overjoyed with her, did you hear her speech, oh I love her, they have to win, on and on. Now we constantly chat on the phone over what is happening today. If she could get my mother engaged in politics after 75 years of just voting who my dad votes for, then the sky is the limit. B. Lou: I was aware of the Palin for V. P. movement but didn't think it would happen. When I came downstairs to start breakfast my husband told me of the plane from Alaska. Oh my, how excited I was! I was still afraid to believe it we true and when I got to work I brought up the Internet & started emailing people I had already told about Sarah. All were as excited as I. I kept checking the Internet until it was official. It was a glorious day but I still don't know how I managed to get all my work done that day. Lol!Dang, I'm getting excited all over again. Lynn: Well, my memory is of her speech at the convention. I came right up out of my chair. I know integrity when Isee and hear it. Sitting here all by myself, I actually yelled.."yahoo!!!" It was the first I saw of real excitementand energy during the whole, entire, boring, campaign. I am loyal to Sarah! Karin: I had Sarah on my radar since May 2008, but thought that John McCain would do the boring thing, and pick Tim Pawlenty of MN -- SNORE. My husband had FOX News on in the morning, as always, and I was anticipating the Pawlenty announcement. But then, I read that Pawlenty was still in MN on Friday morning, (29th) so it couldn't be him...then FOX came on and told of the "story of 2 planes" -- both originating in Alaska!! My heart was beating so fast with anticipation, that I almost was hyperventilating! Then, when it was confirmed that Sarah Palin would be McCain's choice, I shouted with absolute glee!!! She's the one I wanted! She's the one that can speak for me and all the other "regular Americans" out there! She's a mom -- like me, she's a Christian - like me, she's pro-life - like me, she believes in the 2nd Amendment - like me. SHE'S REAL -- NOT PHONEY, like all the other politicians in Washington -- (even McCain).She also had, at that point, a stellar record of ACCOMPLISHMENT as Governor of Alaska in less than 2 years -- something that Barack Obama didn't have. He couldn't point to ANY significant legislation that he proposed or put his name on. Surely, I thought, the American people would see this woman for the absolute wonderful person that she is. This would be a game changer. It was. The game got very nasty against her -- very quickly.BUT -- As we can see now, God has plans for Our Sarah still. The truth about her practical intelligence is coming out, and her true character will shine. The American people will rally behind this wonderful woman, because she will continue to speak for us regular Americans. She's Reagan reborn. She's the new leader. Let's support her every chance we get. Paula: I had never heard of Sarah Palin, the nomination caught me off base, because though even more polarizing, I wanted Joe Lieberman to run with John McCain. I knew it would not happen. I more expected it to be Mitt Romney or Mike Huckabee, other choices who would have been good. I wanted to know what she was about. I did some internet digging and found most of her core values were the same as mine...Then I heard her speach and it blew me away...NO Telepromters, just a real woman with with and a brain. It aggrevated me how the press treated her with trick questions. But she held her grace. Even my husband was impressed and that is hard to do. Joan I do understand about not fitting in. We who hold conservative and moral views that are just no longer main stream. I am not racist, I am not a homophobe, I am not pro-choice, I am not astro turf. I think Sarah Palin put a face to our values. People hated her because she stood for something that is right and good and in their heart of hearts they knew was right also. I think in many cases it was the anger and self hatred of themselves knowing that some of their Liberal views were wrong, that led to rage against Sarah Palin. Susan: When I found out I was ecstatic! I didn't know anything about her...all I knew was that a woman was in the race and I knew that would spice things up. I also knew it would probably change my vote (I was a Hillary Democrat, but I hadn't yet sipped the Kool-Aid.) That was the beginning of the end of me being a Democrat. THANK YOU SARAH!!!!! manajordan: I'm glad I was not the only one who went to bed that night thinking McCain would choose somebody else. In fact I think my exact quote to myself when I switched off the television was "fine McCain choose boring Pawlenty!" The next morning I woke up and was immediately overjoyed to see Sarah Palin pictured as the expected nominee. I was walking on clouds the rest of the day. That was an incredibly memorable day. Wasserjungen: I was happier than I have ever been from a political perspective. Sarah's elevation to VP candidate was the fire that lit the fuse to a long overdue re-alignment of thinking in this country. It's happening now and it's building steam. The old "progressive" (smells communist to me) agenda has it's day in the sun right now and it's wilting faster than anyone would have expected, except maybe for Sarah and her followers. We have an absolute responsibility to future generations of Americans to stop this madness once and for all, to create a prosperous and inclusive society that the loonies cannot possibly assail. We must create an environment of economic growth and human rights support that the entire world will happily join in. That is what our Founding Fathers wanted and if not for Wilson and the Roosevelts we would already have been there. It is time to finally put progressivism, socialism, and communism into the dustbin of history where they belong. We must say as a people "Never Again". Sarah speaks for all of us who actually want to leave something of a country for our children. God Bless Sarah Palin and God Bless America. CCRWM: I don't ever idolize human beings because all my faith, trust and hope is in God and Jesus His Son. Last year I was in Palm Desert with my family, just sick about Barack Obama, and had refused to watch his acceptance speech the night before(there is just so much one can endure). I was watching Fox news that morning and McCain was about to announce his running mate. I was barely interested because, sorry, McCain to me was not a conservative and had done nothing to counter Obama. Then he announced Sarah Palin and when she came onto that stage I honestly felt that God had answered my prayers for a Godly leader. I don't know how I knew that but I have yet to be proven wrong. I know that it is right to support her. Nothing I've seen from her contradicts my belief that she is truely a human who is willing to be God's servant. I pray for her because the evidence that evil people are pursuing her is overwhelming. I admire her strenght, her faith, conviction,integrity, ethics, and so much more.God bless and protect Sarah Palin and her family in whatever she decides to do. rae4LOTUS: A year ago I was sitting in my room cheering and clapping. I yelled to my wife in the other room, "TURN ON FOX NEWS RIGHT NOW!! "I was listening to the audio of the speech on Rush's radio show. Rush commented, "Guns. Babies. Jesus. Hot damn!" At the end of the speech Rush said, "They are going to destroy her." Just gave $29 to SarahPAC. manajordan: There are some really lasting memories from this past year. The day Sarah was announced as the nominee I was walking on clouds all day. There were some other siginificant highlights that I'm sure we all look back on with nostalgia. There was one event though that was just mine, but I wonder if other's had a similar experience.I'm someone who really despises people being treated unfairly. Having been an early supporter of Sarah Palin, I think I can safely say I took the attacks on her (a good and decent person) very badly. The whole campaign seemed pretty turbulent. I was having a hard time just watching it. I can't even begin to imagine what it was like for the whole Palin family to go through that. But, there was one day about a week prior to election day that I felt this peace just wash over me. It was such a tender mercy. I felt assured that I should not give up hope. It was not just hope for the outcome of the election it was hope that I'd be okay, that our nation would be okay and that Sarah Palin and her family would be okay. I believe that God has granted us the precious freedom to choose. With those choices come consequences, good and bad. I also believe that for those who truly put their trust in God He will sanctify our trials, even the ones we cause ourselves for our good. I knew that the nation might be headed for bad times because of its citizens choices, but that as we humbled ourselves and through the grace of God, we could be a better nation for it. I knew that if I personally trusted in God and kept trying to do His will He would do the same for me. And I knew that not matter what Sarah Palin decided to do, that as she continued to put her trust in Him (something that is so familiar to her), God would have her and her family in His arms and bless them with peace and sanctify all trials for their good. I'm so grateful for that memory, and I've held on to it since. Sorry, for the long comment. Thanks C4P for being a beacon of truth. Shiela: Before Sarah was picked as John McCain's VP. I was on McCain's facebook and a lot of people would say "McCain pick Palin." I did not know who these people were talking about. When she was choosen I was watching TV and I felt this connect with Sarah. Sarah is a servant and she works with a servants heart. rorie: I remember hearing the announcement and her WONDERFUL speech the first time, and how much hope it gave me that we as a country might have a fighting chance after all! She is just what our country needs, now more than ever, and she made me CHEER for the first time in that campaign. Now I look forward to her leadership as we move through the perils that are facing our nation as we speak. I will be standing beside her and any others that will fight to defend our Constitution. GO SARAH!! Jordan: The selection of Sarah Palin as McCain's VP nominee completely blew me away. I stayed up till midnight here in Australia (because I enjoy politics) and expected it to be either Tim Pawlenty or Mitt Romney. I was extremely surprised and excited when I heard the previously unknown name of Sarah Palin announced and I do have to salute Senator McCain for an excellent job of keeping the surprise a secret. After I watched Palin's debut speech in its entirety I realized it was 2.30am! Still I'll always remember watching that speech alone, late one night on my couch. Bless you Sarah! You are the first and only politician to ever make a cynic like me excited! Carmela: Stuck in traffic taking my daughter back to school in NYC, my son called me and told me McCain selected a woman from Alaska as his running mate. He was worried we would loose the election because no one knew her. I agreed, then I heard her acceptance speech, I've been hooked since. I will support her in any way possible. She is the truth. I do not have money to spare but I send any amount I can to Sarapac to keep her moving for us! James: I had given up on the Republican Party, with its wimps and closet liberals. Then came Sarah! America needs to know that liberal news media attacks her so viciously because they see her truth and straight talk. They know she is a STAR. They know she can ignite the American public to action and are making a massive effort to destroy her credibility. She is America's hope. The woman is America! piper44425: Since people from all over the country are sharing their stories I thought I would too. Exactly one year ago today I had no interest in voting, and didn't care for any type of politics. I didn't know whether I was a conservative, liberal, or moderate. Tell you the truth I didn't even know what it meant. I was lying in my room when I heard a lot of commotion coming from the family room where my parents were watching foxnews. They couldn't believe who Senator MCcain just named for his VP pick. My dad even bet money on who MCcain would pick. He lost $50 that day along with all his buddies who go fishing with him every year in the boundry waters; basically Canada. My dad said Romney would be the VP pick. But since all of his friends were wrong on who would be the VP pick, the money went into a savings account for their next trip. So back to my story I'm think I'm done rambleing now, but you never know. I went into the other room to my dad saying "Wow, who on earth is this woman!" Pardon my dads language his quote not mine. I first thought that Sarah would just be another Hillary Clinton. Basically not attractive and the worst possible candidate for VP. Man was on wrong! I saw Sarah and my reaction was "Wow she's stunning, and she seems nothing like Hillary Clinton." At that I was right. Her speech was uplifting and motivational for me. Sarah made me see politics in a different light, a brighter light than what I had seen in the past. I loved her family when Sarah introduced them to us. After listening to her speech live on foxnews, I went straight to the internet to learn all I could about Sarah and her family. The more I read the more I liked Sarah and the more I wanted to get into politics. I realized that what I was reading was actually reminding me of how I am. It was really uncanny at how alike Sarah and me are. I am very religious, played basketball for 10 years Sarah and I had the same number, shy towards guys at first, a great student with A's and B's through high school, and we even have the same first job; I'm a waitress now. But we also have major differences, I would never compete in a beauty pagent, and I really didn't have a high school flame because I just didn't want to deal with all the drama guys tended to lead to in high school. When I showed my parents what I found they thought I was crazy until they read the book I bought about Sarah that day. They agreed with me that we did have a lot in common with some differencs. That day I went out to register to vote as a republican, Sarah influenced me to vote and helped to convince me that I was a conservative, and a young conservative at that. Jack: One year ago yesterday, I was only half interested in the election. I knew John, even though a great American hero, was no match for Obama. A month earlier, I had been reading Investors Business Daily, and there was an interview with the Gov. of Alaska about energy policy. I read the interview and was very impressed with the Gov. grasp of energy issues. So, when John announced her name, I already knew a little about her. Then she and Piper came out. My first thought was, WOW she is pretty! However, how much 'there' is 'there?' Why is she so popular in Alaska?...... For the next several days, I read the biography of her that had just come out, and couldn't put it down. Terry: When I heard the news I was at work. I didn't know what a Sarah Palin was. As the near days went by I looked froward to her convention speech. I knew she could pull it off because of the pieces of her speaking I had seen on the news. After the convention was over I saw her at "The Villages" in Florida. I call it "Sarah Stock". We wrecked the place! In the heat I walked 3 miles in from remote parking. In line to get in I asked a woman how many she thought was there. She said she was there when Bush spoke and they had about 23,000. I said they were expecting about 25,000 how did she think that number compared to that she was seeing. She turn to me in a shocked look and said, "Oh no, this crowd is much larger!" The crowd had shut down traffic coming in and out of The Villages. The fire martial estimated 60,000. Estimating and controlling the saftey of crowds is his job. There were times I thought it's not safe... the temps were in the 90's. I was in the "pit" at the back of the stage about 30 feet behind where she would be speaking. There were retired women there in wheel chairs who refused to give up their places even in the heat. They weren't leaving TILL THEY SAW SARAH! 100 people were medivaced out due to the heat. I stayed. I'm usually pretty tough... it scared me. They were throwing cold water bottles into the "pit" to try and keep us hydrated. There was a plane flying overhead with a banner "The South is Palin Country". What a joy to see it. When she finally got off the bus we could see her on the big screens waving at us on camera. She was the Energizer Bunny! When she hit the small stage I thought I'm looking at the first woman president! After her speech I watched as she signed autographs as fast as she could. There was a drop of sweat on the end of her nose and 3" band of sweat down the back of her jacket. She didn't slow down for a moment! Always a smile. It's true that she is more beautiful in person than on camera! I got an autograph and was interviewed by the Leesburg paper. I couldn't get over that what I was seeing was so much bigger than a mere election. I finally saw someone on the national stage that was me. Not a day has gone by that I have not thought of her and prayed for her. Cynthia: I didn't know much about Sarah when it was announced that she would be McCain's vp pick. I initially felt that picking her was just McCain's attempt to do something "outside the box" and get more attention for himself, so I thought it was a bad idea. I was at work the day she was introduced, and I had the event streaming on my computer. The moment she walked on stage, I was absolutely and totally overwhelmed by her. I was crying at work! I've followed her closely since then and vowed, following my first Tea Party on 4/15/09, that I would work for her should she decide to run for national office. She is on my prayer list daily. andrea: I woke up and looked on our local Fairbanks, AK newspaper online, saw that Sarah had been selected to run for VP and screamed with excitement! She was my hero as our governor and I was so excited that she was chosen to run for higher office! I called everyone in my family in the lower 48 and spread the word about how great she is! Tim: Having been up late, I was sleeping in and my mother gave me a wake-up call, saying that we now know which Governor whose name starts with "P" had been picked as McCain's running mate. She asked me if I had ever heard of Sarah Palin. I mumbled, "oh god yes" and she asked, "What does this mean?" I mumbled, "It means that we may have just won the election. More importantly, the Soul of the Republican Party has just been saved." By mid-morning, I had dragged myself out of bed, TiVo-ed the official presentation, and saved it. Must have watched it a dozen times before deciding to put it on videotape for posterity. If you've got a story, post it in the comment section.